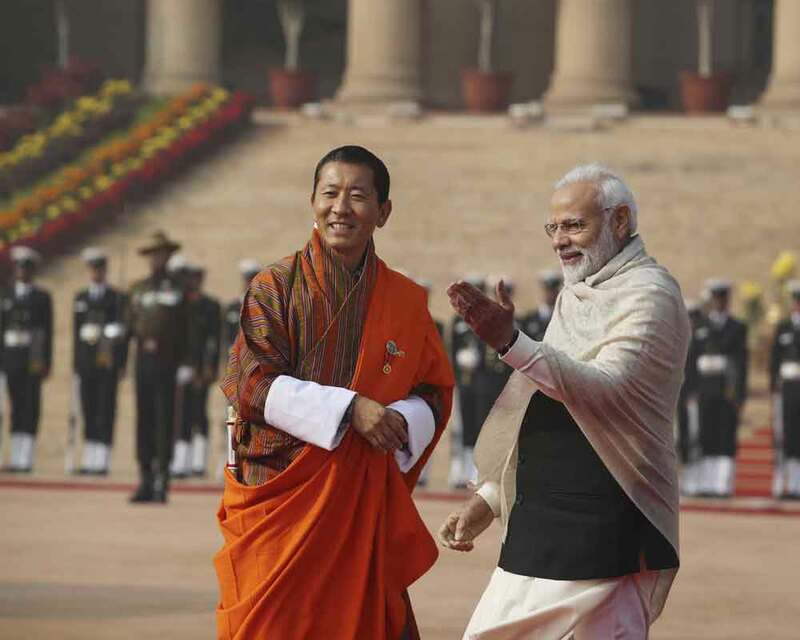 Prime Minister of India Narendra Modi on Friday announced a Rs 4,500 crore financial assistance to Bhutan for its 12th five-year plan after holding wide-ranging talks with his Bhutanese counterpart Lotay Tshering. In his media statement, Prime Minister Narendra Modi said hydro power cooperation with Bhutan is a key aspect of bilateral ties and that work on the Mangdechhu project will soon be completed. Tshering arrived here on Thursday on his first foreign visit after taking charge as PM of the Himalayan nation last month following his party’s victory in the general elections. Prime Minister Narendra Modi said he has assured the Bhutanese prime minister that India, as a trusted friend, will continue to play an important role in Bhutan’s development. India will contribute Rs 4,500 crore in Bhutan’s 12th five-year plan, Modi said. Tshering on his part noted that Prime Minister Modi was the first head of state to to congratulate him on his electoral victory. He also thanked India for its continued support to his country’s developmental needs. The new five-year plan of Bhutan began this year and will continue till 2022. Earlier in the day, Tshering was accorded a ceremonial welcome at the Rashtrapati Bhavan. External Affairs Minister Sushma Swaraj also called on the Bhutanese premier this morning. Prime Minister Narendra Modi said he has assured the Bhutanese prime minister that India, as a trusted friend, will continue to play an important role in Bhutan’s development. India will contribute Rs 4,500 crore in Bhutan’s 12th five-year plan, Modi said. Tshering on his part noted that Prime Minister Modi was the first head of state to to congratulate him on his electoral victory. He also thanked India for its continued support to his country’s developmental needs. External Affairs Minister Sushma Swaraj congratulated Tshering on the assumption of the high office of Bhutan’s prime minister and the two leaders had a “warm exchange of views” on important aspects of the bilateral relationship, Ministry of External Affairs Spokesperson Raveesh Kumar said. Tshering also laid a wreath at Mahatma Gandhi’s ‘samadhi’ at Rajghat.